Arms: Gules three chevronels between in chief two mascles flory and in base an annulet all Argent. Crest: On a wreath of the colours a griffin Gules resting the sinister claw on an annulet and charged on the wing with a mascle flory both as in the Arms. I had a look in Burke’s General Armory* and the Harleian Society’s Grantees of Arms for more details about the Grant of Arms without success. 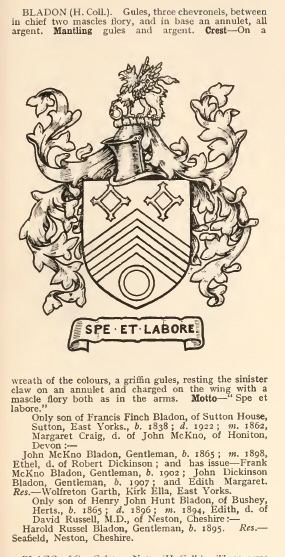 However, in Gayre’s Armorial Who is Who 1979-1980 he notes that the Arms were granted by the College of Arms 14 Aug 1928 in the name of John McKno Bladon (Frank McKno Bladon’s father). In Fox-Davies’ Armorial Families the entry also lists the son of John McKno Bladon’s cousin as an armiger. 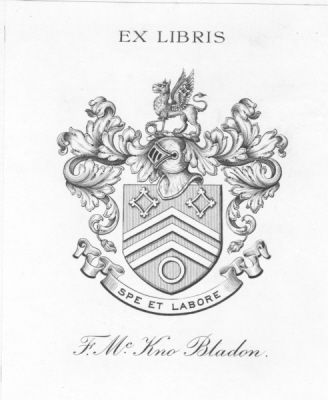 That would be the case if John McKno Bladon had the Grant of Arms in the name/memory of his grandfather, Thomas Bladon. Through the power of Google and Ancestry.co.uk the family is as below. Those in brown are the implied armigers if Fox-Davies is correct. Those in blue are armigers as the Grantee and his descendants. Col Bladen 1715 – Arms: Gules three chevronnels Argent Crest: On a ducal crown a griffin passant winges extended Or holding in his mouth an arrow proper. Bladen, Glastonbury – Arms: Gules three chevrons Argent Crest: A greyhound’s head erased proper. Bladen (Alderman of Dublin 1663) Arms: Or three mascles in fess fleury Gules on a canton Azure a chevron of the field.